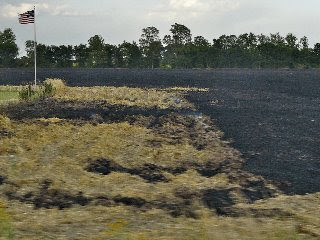 Announcements from the film project "YERT – Your Environmental Road Trip"
American farmers still burning crops. What will it take to get “old timers” on board with newer practices that will save $ and preserve the earth? This morning I received an email from Arkansas farmer Norwood Creech, whom YERT corresponded with while seeking out rural farmers in the South. She wrote with great concern about “old time” farmers burning off crop stubble (rather than turning it under as compost). The farmers are burning off their wheat, again. This process is not “more better” than rolling the stubble into the ground. Burning is the ways of the old timers. However, it also seems to be the ways of the misguided and uneducated. The first 2 photos are from our roof top here in Lepanto, AR. We are seeing 8 of these [burns] plus some, every evening now for the past 5 days. And that is just in the evening… about when the wind dies down and the smoke started from late fires settles. I am talking acres and acres of these wheat fires, burning rapidly and some even make their own clouds! This entry was posted in Issues, Julie by Julie. Bookmark the permalink.